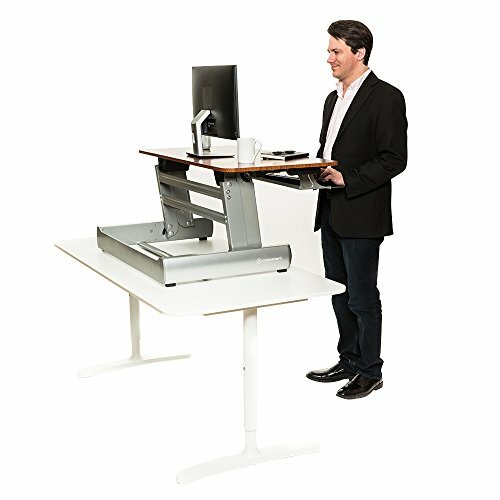 Switch from sitting to standing in seconds with the most popular InMovement Standing Desk, the Elevate DeskTop DT2. This 41" retrofit standing desk solution comes fully assembled and has ten different adjustable height settings. Simply place the InMovement Standing Desk on top of your existing desktop, grasp the handles, and adjust the product to your desired standing height. The In Movement Standing Desk is available in three high-end finishes to complement any workspace. Choose from a modern white, an elegant light grain, or a rich dark grain finish. If you have any questions about this product by InMovement, contact us by completing and submitting the form below. If you are looking for a specif part number, please include it with your message.